A Private Residence Wedding in Rhode Island allows couples to make their wedding day a more personalized experience. Ideally, a private residence wedding should be held outdoors, unless there is ample space in the home hosting the event. As a result, it is best to have a Private Residence Wedding in Rhode Island during the warmer months of the late spring or summer. Typically receptions that are held at a private home require couples to rent a tent and portable restrooms, unless they plan on allowing guests into the house. There are a number of other costs and aspects of having this type of wedding that need to be considered. The cost can often be comparable to holding a wedding at a venue when all is said and done. The difference is a that a wedding at a private residence can be whatever the couple wants it to be. It can be casual or more formal, and it can included individual touches that are specifically unique to the bride and groom. There are also no time restrictions, meaning if the couple chooses to the party can last all day and night. The photograph shows the scene late into the evening of the wedding reception. Trees stand tall in the yard, with lights strung from branch to branch. The tiny lights look more like a string of stars against the dark of the night sky. Vibrant colors cover signposts that point to some of the places the couple has ventured to together. The bride and groom love to travel and go on adventures together and today they have embarked on the greatest adventure of all. 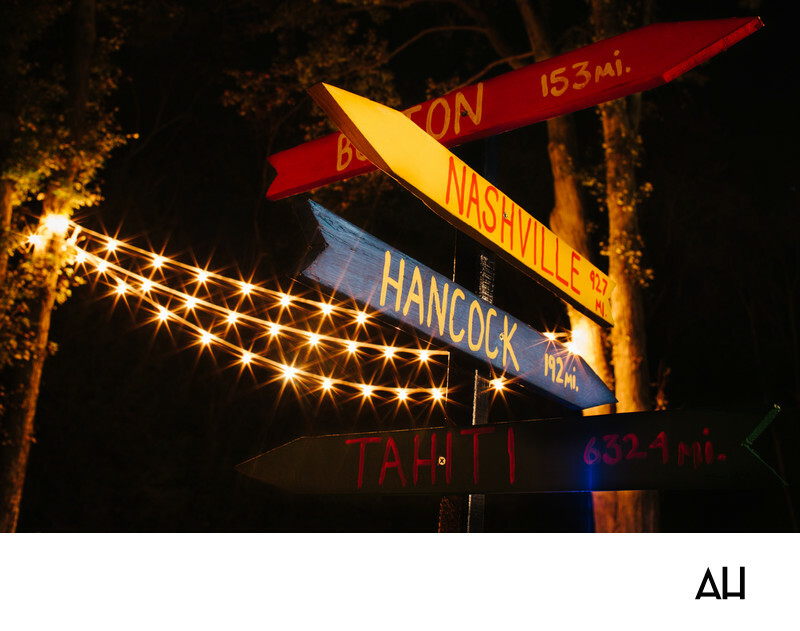 This sign includes Boston, Nashville, Hancock, and Tahiti, with the miles it takes to travel to each destination. It is symbolic of the many miles the couple has spent walking together through life thus far.